Our peacock bass average just over 2 pounds, with a 3 to 5 pounder not that uncommon. Just about any lure that catches largemouth bass will catch a peacock bass.... if you move it fast enough. Hawaii peacock bass seem to go for the smaller lures moved in a quick erratic action. They also seem to like the heat of the day and sunshine. We use spinning, bait casting, and fly rods. Chris likes to use 4#, 6#, and 8# test line on the spinners, 12# test on the bait casting reels. (30# test PowerPro during spawning season) I like a 5wt or 6wt fly rod with an 8# or 12# tippet. (peacock bass are not leader shy) Recently, I've really had fun catching small peacock bass and red devils using my Tenkara rod. Here are some of the lures we use when fishing for Peacock and Largemouth Bass. 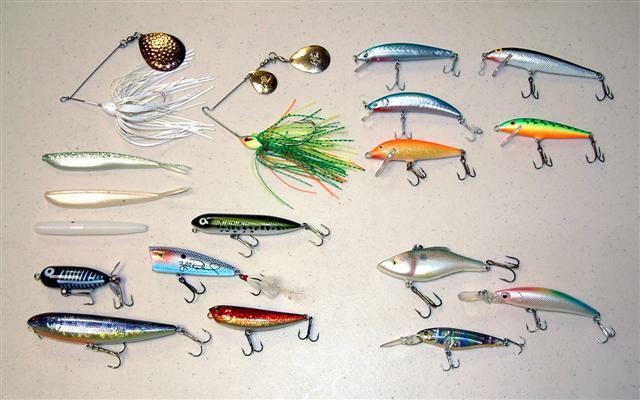 Clockwise: Spinner baits, suspending and floating minnow type lures, diving lures, surface lures like the Sammy and Tiny Torpedo, soft jerkbaits like the Fin-S and Senko. These are the lures Chris had tied on his rods the day after they caught 18 peacock bass. Note the small size, that gold CastMaster on the left is only one inch long. 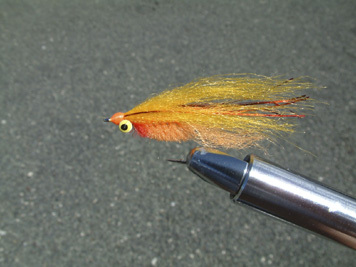 The other day someone ask what kind of flys to bring to Hawaii for peacock bass. 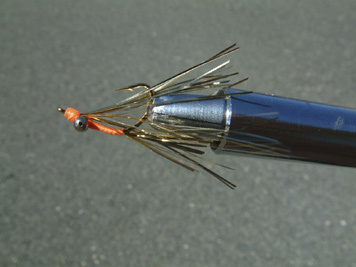 I visited Sean down at Nervous Water fly shop and he showed me some stuff that Clay and the guys had tied. These repersent little fish. Peacock bass feed mostly on small fish so I guess anything that looks or acts like a fish will work just fine. Topwater fishing is always fun and exciting. When they are schooling, peacock bass just love a topwater. Again, see how they look like small fish. Notice the small size and big weighted eyes. 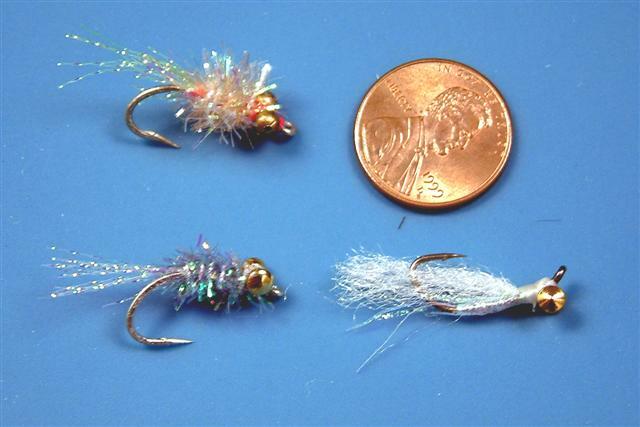 These flys can be fished shallow and fast... or deep and slow using a sinking, or sinking tip line. My favorite colors are white, or pink, or yellow, or.... well the fish don't seem to care once they are feeding. Most of the time the fish cruise the shore line, so we do a lot of casting right against the grass and logs on the shore. 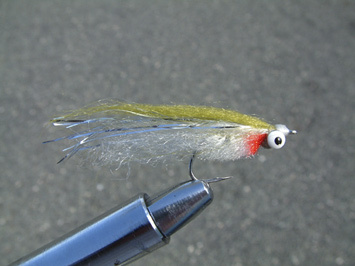 These flyes are tied so the hook rides up making it a little more weedless. 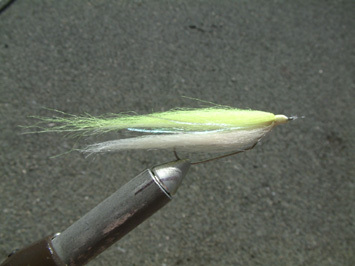 The White streamer with the read throat is tied on a "keel hook"... it's much more weedless. The shad and small tropical fish (we probably have more tropical fish in the lake than in most Pet Stores) are on the small size. Our peacock bass average just over 2 pounds.... So we seem to catch a lot more fish on smaller flys. But that doesn't mean they won't take a larger fly... or that larger fish won't take a small fly. 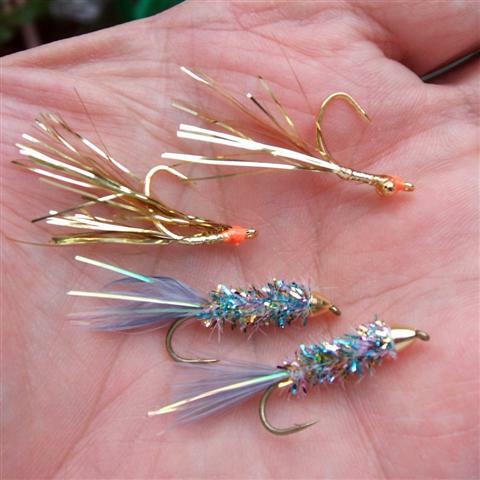 Also note that these flys are tied on bass "worm" hooks. Worm hooks have proven to be rather weedless also. 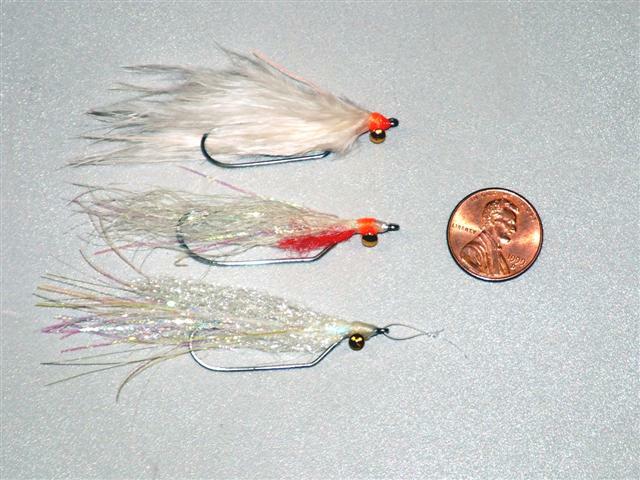 White streamer flys tied on a keel hook. 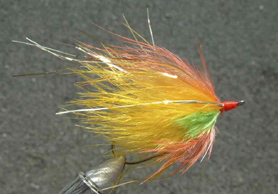 Well, almost any color streamer as long as it's tied on a keel hook. 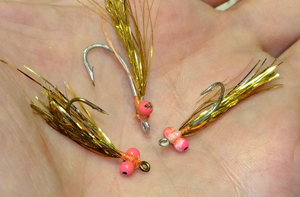 Keel hooks make them almost weedless. 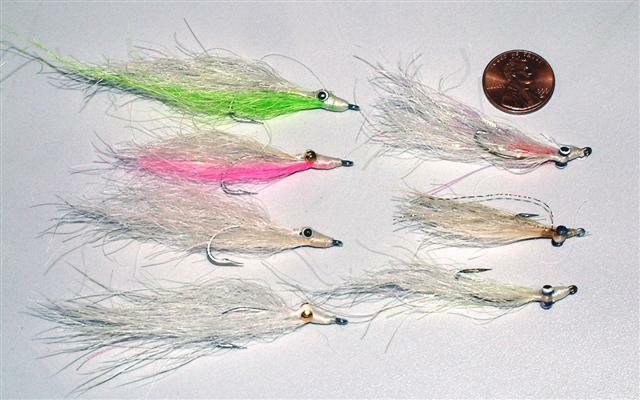 Too bad Mustad doesn't make the Saltwater Keel hooks any more. 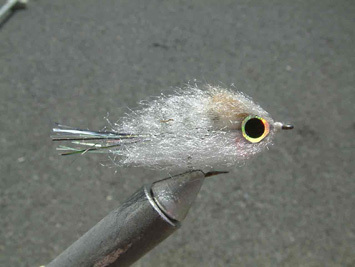 Weedless flys that don't rust. I love that. 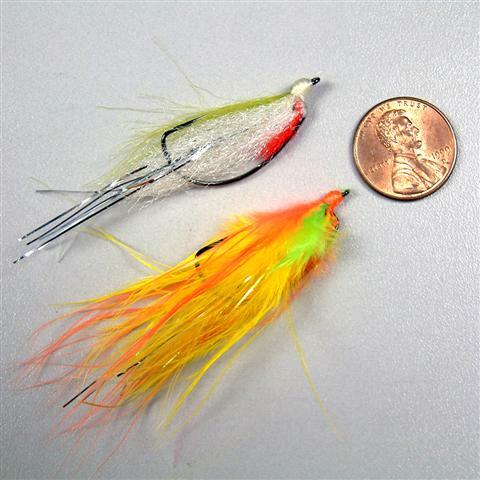 Assorted Yak Hair flys. Yak hair really shines. Schooling Peacock bass will hit these too. Here are some of the first peacock bass flys we ever tryed... and they still work after all these years. Gold Flashabou - Peacock Bass really seem to like yellow & gold. My newest catch everything fly... 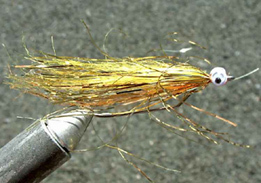 The "50 Cent Fly"
It's a Crazy Charlie with bead-chain eyes and some gold flash-a-boo. That's it... so easy and it works on all kinds of fish in fresh and saltwater.